We visited the beautiful city of Richmond, Virginia, a few years ago. We wanted to see St. John’s Episcopal Church and pay our respects to the amazing men and women who stirred up the flames of independence in the foundational years of our country. I haven’t written much about it because I snapped literally hundreds of photos of the half dozen places we visited… and I haven’t gone through them all, yet! But I am slowly chipping away at the project. 🙂 As I sift through the photos and recollect all the wonderful things we saw and did and learned, the story about a young man named Edward Carrington strikes my fancy. In Richmond, at the now famous St. John’s Church Episcopal Church, a meeting was scheduled by the Virginia delegates on March 23, 1775. There, members of the state legislature (the house of burgesses) would debate whether to support or withhold support for Massachusetts and the cause of independence; namely, to pass a resolution to send Virginia militia to aid the Massachusetts military. The church was so packed with people that many had to stand outside, listening to the debates through the open windows. 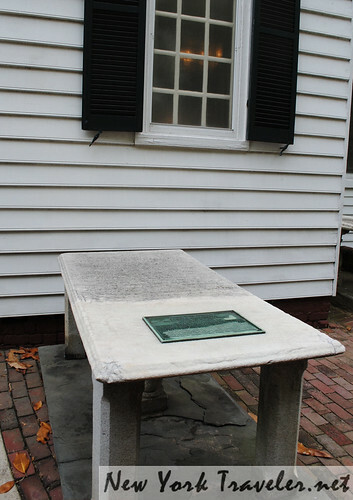 Edward Carrington stood outside one of the windows, listening intently with a group of young Virginia patriots. Gentlemen may cry, Peace, Peace — but there is no peace. The war is actually begun! The next gale that sweeps from the north will bring to our ears the clash of resounding arms! Our brethren are already in the field! Why stand we here idle? What is it that gentlemen wish? What would they have? Is life so dear, or peace so sweet, as to be purchased at the price of chains and slavery? Forbid it, Almighty God! I know not what course others may take; but as for me, give me liberty or give me death! Carrington grew to become an illustrious member of the Continental Congress 1786-1788; was appointed by President George Washington as the marshal of Virginia in 1789. He also served as foreman of the jury during the trial of Aaron Burr for treason in 1807. Carrington died in Richmond, Virginia, on October 28, 1810. 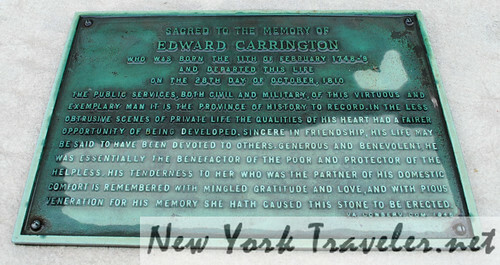 His friends ensured that Carrington’s wish was granted, hence the monument in his honor. 🙂 I love it. I love little stories like this, that so poignantly reveal the incredible passion and honor for the men and women who carved the way to freedom. It’s so easy to get caught up in the craziness of day to day living, concerned about global issues and the next paycheck and such, to feel selfish and pout that things aren’t always going our way. And maybe some of us have good reason to be dismayed, in such an economy and society. But it’s good to remember the goodness of God and be thankful for our freedoms. Little things like Carrington’s passion are a good reminder of what’s really important. I just love stories like this!